Adam Byrn Tritt, MEd, CH, LMT, is a Writer, Creativator, Imaginateer, Wordatarian, and Sematicist. He is a poet, essayist, screenwriter, teacher, social activist, and humorist. Tritt is the author of The Phoenix and the Dragon: Poems of the Alchemical Trans­form­ation; several works of nonfiction, including the international bestseller Tellstones: Runic Divination in the Welsh Tradition; and the delightful (and slightly disturbing) Bud the Spud. His newest books are Songs from the Well, a memoir in essay and poetry and Yom Kippur as Manifest in an Approaching Dorsal Fin. 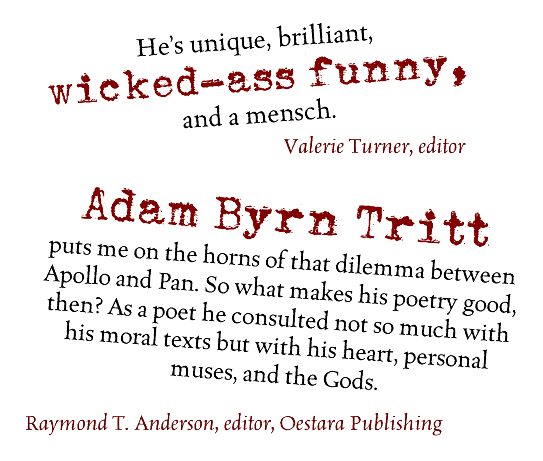 Adam won the 2006 EPPIE Award for Poetry in an Anthology. In 1995 he was awarded an honorary doctorate for his work in religious tolerance and for the creation of TurningPoint, a nonprofit program providing alternative medicine to low-income individuals. He continued that passion in the healthcare clinic he and his wife, Lee (of blessed memory) dreamed of and created together—the Wellness Center. Today he teaches Advance Placement English for unsuspecting high school students. To read more about Adam, see his Publications page, or take a look at his Curriculum Vitae. He is equally at home speaking in lecture halls, giving public readings in bookstores, and visiting elementary school classrooms, where he can be found surrounded by children begging him to read Bud the Spud just one more time (while their parents and teachers beg him to stop). Adam lives and writes—often simultaneously—in Melbourne, Florida, with his sweetie Lisa, Sam the Cat, his dingo and a ridiculously large alligator, all under a very big tree. You can find his stimulating blog—mostly essays, creative non-fiction, and poetry—here. He has some very cool swag for sale on the Merchandise page, like his PoetryPosters and Notecards. And some wonderful items featuring the lovable Alpaca Jones. Trust me, once you see this stuff, you won’t want to live without it. Announcing the Ten Percent Project! Ten percent of all income from purchases made at AdamTritt.com will be split between two of our favorite charities: Heifer International, which provides gifts of livestock and plants, as well as education in sustainable agriculture, to financially disadvantaged families around the world; and Namaste Direct, which funds small loans to first-time borrowers, primarily women, in some of the more marginalized communities in Central America. These loans are used to create or augment a small business such that the borrower can reach economic self-sufficiency for herself and her family. Adamus in Wikipedia? Well, yes. Adam is mentioned in Wikipedia on the page dealing with runic magic. This is due to his book Tellstones: Runic Divination in the Welsh Tradition. He is also mentioned in a Wikipedia page about the 34th Street Wall in Gainesville, Florida. But other than that, why on Earth would he not have his own page? We haven’t any idea. It’s beyond us. Adam is always eager to hear what people think of his work. Even if what they have to say isn’t always pleasant. If you’d like to get in touch with him, please use the form below.